An incomplete list of all the people Donald Trump has said should be jailed. 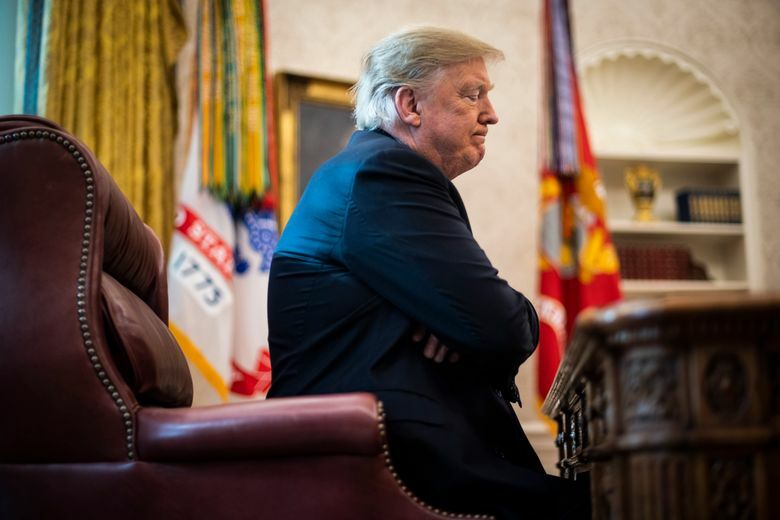 President Donald Trump during an interview with Washington Post reporters in the Oval Office at the White House on Tuesday. (Washington Post photo by Jabin Botsford). Perched at the top of the list is obviously Hillary Clinton. As Donald Trump's foe in the bitter 2016 presidential election, Clinton was an easy target for Trump's attacks. "Lock her up" chants are still a fixture at Trump's rallies. Prison is always creeping into President Donald Trump’s thoughts. On Twitter, in interviews, at campaign rallies, the president is constantly referencing jail or crimes punishable by time inside a cramped cell. It is not that Trump is focusing on how two members of his inner circle — Michael Cohen and Paul Manafort — are looking at serious prison sentences. Rather, Trump’s mind is constantly zeroing in on allegations and felonious innuendos related to his enemies. It seems that if you are on the president’s bad side, jail or prison is where you belong. Trump generally fires off these claims despite having zero obvious evidence of any actual illegal behavior. Wednesday was a good example. On Trump’s Twitter page, the president shared a meme from a supporter’s account showing a variety of Trump enemies locked up behind bars. Included in the cast of characters was Deputy Attorney General Rod Rosenstein, the Justice Department official who until recently was overseeing special counsel Robert Mueller’s investigation into Russian election interference. When asked later about why he would share an image featuring Rosenstein locked up, Trump had a blunt answer: “He should have never picked a special counsel,” Trump told the New York Post. Rosenstein joins a crowded roster. The president often undercuts his political enemies by suggesting they are criminals or have broken the law in some way. It’s a group that contains the usual suspects (the Clintons) and some surprises (Snoop Dogg?). What follows is a by-no-means-complete list of the figures the president has publicly said should be jailed or investigated, or has accused of committing high crimes and misdemeanors — allegations that seem to have no basis in reality. Let’s not forget James Comey, the former FBI director whose termination last year sparked much of the legal hassles that have consumed Trump’s presidency. As the New York Times reported earlier this month, the president wanted the Justice Department to prosecute both Clinton and Comey. Liberal philanthropist George Soros, a figure of contempt on the right, is also among the individuals Trump has targeted for incarceration. Only hours after a pipe bomb was delivered to Soros’ home last month, the president gave a White House speech calling for unity. When members of the audience yelled Soros’ name and “Lock him up,” Trump reportedly laughed and repeated the phrase. Trump is quick to point out corruption and possible bad acts everywhere. Andrew McCabe, the former FBI deputy director, was a regular Trump target: “Why isn’t disgraced FBI official Andrew McCabe being investigated for the $700,000 Crooked Hillary Democrats in Virginia, led by Clinton best friend Terry M (under FBI investigation that they killed) gave to McCabe’s wife in her run for office?” the president tweeted in May. “Paul Begala, the dopey @CNN flunky and head of the Pro-Hillary Clinton Super PAC, has knowingly committed fraud in his first ad against me,” he wrote of the television political commentator in May 2016. Steve Rattner, a former Obama official and current cable news personality, has also been attacked by the president. “. @SteveRattner While I think you should have gone to prison for what you did, I guess Obama saved you. But watch — I will win!,” Trump wrote before the 2016 election. When hip-hop legend Snoop Dogg released a music video that included footage of him pointing a prop gun that fired out a “BANG” sign at a Trump caricature, the president suggested it was a criminal offense. Treason is a favorite Trump charge, one he bandies about most readily, even if his concept of the crime stretches beyond the legal definition. People who leak information? “[T]raitors and cowards, and we will find out who they are!,” Trump has tweeted. Army Sgt. Bowe Bergdahl? “[A] dirty rotten traitor,” according to Trump. In a later interview with Fox News, the president suggested the paper itself had committed the crime by running the piece.